Oh I just read it, cool. Turn will be up soonish. The Yin Brotherhood: Use racial ability to switch resource and influence values of Qucen'n. The L1z1x Mindnet: Play Action Card "Alien Technology" (AC 4 --> 3), but is countered by a "Sabotage" play by Naalu (Naalu AC 4 --> 3). 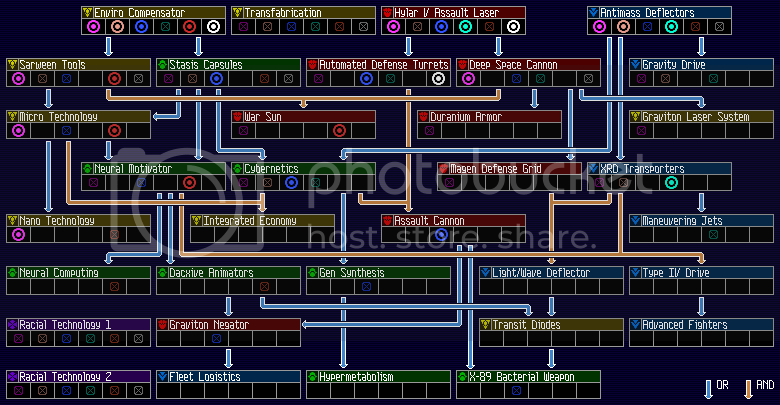 Play Primary Ability of (7) Technology II Strategy Card, gaining Automated Defense Turrets and exhausting [0.0.0] (5R), Vega Major (2R), and Vega Minor (1R) to gain Assault Cannon. Creuss plays on the secondary (SA 3 --> 2), exhausting Lodor (3R), Tequ'ran (2R) and using 1 Tech Credit from Tequ'ran to gain Hylar V Assault Laser. Muaat plays on the secondary (SA 3 --> 2), exhausting Capha (3R), Quann (2R) and using 1 Tech Credit from Quann to gain Neural Motivator. Yin plays on the secondary (SA 2 --> 1), exhausting Qucen'n (2R), Vefut II (2R), and using 2 Tech Credits from Hercalor and Tiamat to gain Enviro Compensator. Jol-Nar plays Action Card "Master of Trade" (AC 3 --> 2), but is countered by a "Sabotage" play by Naalu (Naalu AC 3 --> 2). Jol-Nar plays on the secondary (SA 1 --> 0), gaining Deep Space Cannon. As I said, we'll see how the free un-counterable attacks play out when its all over. Not like you're going to use them on any of your friendly neighbors. Build two fighters at Quaan by spending a Strategic Allocation. Just take solace in the fact you're across the board from us, oh kindly neighbor. I think you, sir, need to go back and reexamine your definition of "soonish." Soonish is sometime in the future when I am not so tired I doubt my thoughts. Take a tactical action, activate Wellon system, Move in carrier from Torkan system carrying 2GFs and 2 fighters, move in 2 destroyers from Lodor. Land both GFs on Wellon to claim the planet. I just realized, no one can take the wormhole nexus away from Creuss? That was the idea actually, there might be an action card that allows someone to bypass that ability though. That is correct. Under normal circumstances, no players save the Creuss may enter the Wormhole Nexus, so long as they have at least one ship there and Mallice is under their control. It's currently the Jol-Nar's turn. Wow, that spun around fast. Trying to come up with a consensus move, will attempt to post one later today. Sorry for the delay, wanted to make sure we didn't have any other plans. You had to wait to get home from work to say "PASS"? What a silly goose. Hey now, he had to wait to confer with his partner to PASS. That's totally legit. Well maybe stever777 has to confer with himself! That's totally legit according to several movies I have seen. Movies you say? Well then that totally changes the entire situation. I saw a movie once where 2 chicks ordered a pizza but then didn't have any money to pay for it...that kind of movie? Most of them involve Jim Carrey, so maybe? Big Sausage Pizza now starring: Jim Carrey! Man... that's a long way down in cinematic quality from his previous work. It is currently the Yin's turn. @MrBody, you're up. Yin uses Warfare II primary to put the Darien system fleet on high alert! I PLAY the secondary ability, spending a Strategy Allocation Counter to move the dreadnought from Druaa to Bereg. Pass on Warfare II secondary. The Councilor paced along the length of the Overmind's chamber. "The preparation's are finished Overmind." "53nd 0rd3r5 70 7h3 f1227. 7h3 7im3 h45 c0m3 f0r 4 5h0w 0f f0rc3 70 4553r7 0ur d0min4nc3 in 7h3 g414xy." The L1z1x take a Tactical Action, spending 1 Command Counter, moving 1 Carrier with 3 Fighters 1 PDS 1 GF, 2 Dreadnoughts with 1 GF each, and a partridge in a pear tree from the Vega System into the Loki System. The L1z1x fleet receives their orders from 0.0.0. Instantly the fleet whirs to life, men running to man their battle stations. The L1z1x Admiral taps into the ships' PA system, "Prepare for combat jump! Arm the Assault Cannons!" Alright, looks like we've got some real combat now. I'll need some preliminary orders from L1z1x and Naalu in regards to cards and casualties, and then I'll start resolving things. That partridge is going to be the key. Calling it now. We Snakes trust too much. I thought Mecha Units were not effected by bombardment since it removes Ground Forces. They're not (pfff, who ever heard of tanks being taken out from the air?). War over a sabotage card? Last time I trust a Mindnet. Pssssssh, silly snakes, trusting a Mindnet.